Vintage From Paul is pleased to offer these Warwick China Restaurant Ware Green Geometric Salad Plates. These Warwick China Restaurant Ware Green Geometric Salad Plates are identical to the bread and butter plates we have from Walker China. Warwick China was founded in 1854 in Wheeling west Virginia and sadly, closed its' doors in 1951. Warwick manufactured restaurant ware for the railroads including the Erie, Pennsylvania, and Baltimore and Ohio Railroads among other clients. 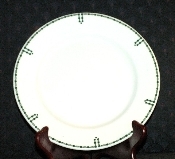 The Warwick China Restaurant Ware Green Geometric Salad Plates measure 7-1/4 inches in diameter. Each of the available Warwick China Restaurant Ware Green Geometric Salad Plates is in Mint condition with no chips, cracks or discoloration. The graphics are crisp, the colors vibrant. The Warwick China Restaurant Ware Green Geometric Salad Plates appear to have been very gently used, if used at all. The Warwick China Restaurant Ware Green Geometric Salad Plates are marked with "Warwick China Made for H. Leonard & Sons, Grand Rapids Mi, 1940".